Nissan is all set to reveal the India-spec Nissan Kicks today at an event held in Mumbai - which was also the city where the carmaker used to have a design centre for its global products. The design centre is now moved to Chennai, and has played a very important role in the design of the India-spec Kicks. Unlike most localised designs, which usually only comprise of a few cosmetic differences over the global model, the India-spec Kicks is a bigger challenge considering the fact that it's larger than its global sibling. 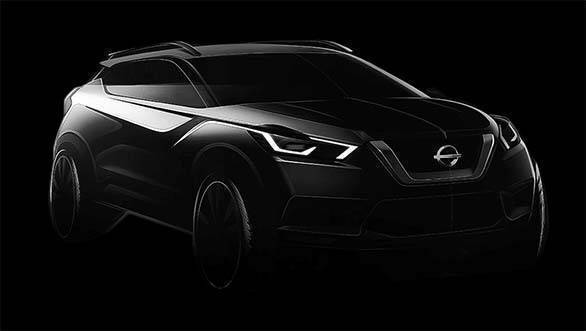 While the teaser images revealed by Nissan India confirm that the car won't look too different than its international counterpart, it will be interesting to see how the design is adapted to the larger proportions of the India-spec Nissan Kicks. The car will be�revealed at 12:00PM IST today, so stay tuned for all the updates! Here is the new 2019 Nissan Kicks in Indian spec. It is slightly larger than its global version and is coming to India in January 2019! That then is the India-spec Nissan Kicks which goes on sale in January 2019. The India-spec Nissan Kicks will sit on a longer wheelbase compared to its global sibling, meaning that the cabin will be roomier too! The India-spec 2019 Nissan Kicks will be larger than its global counterpart (pictured). It will be longer and taller than the model sold in the US, Europe and the Middle East.